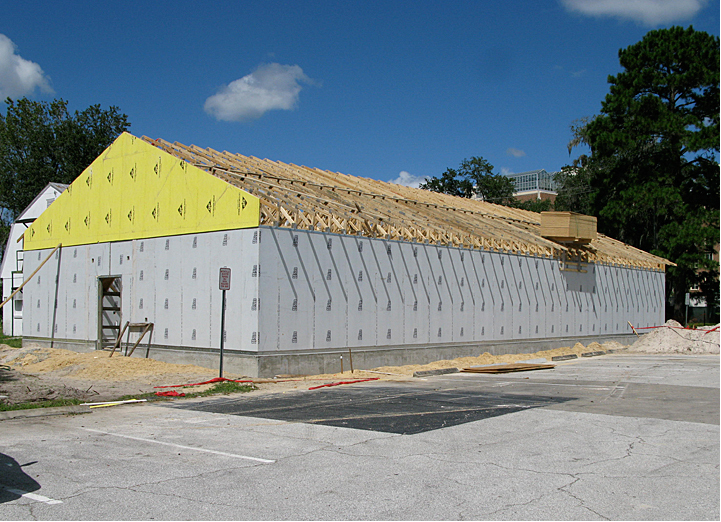 The UF Aquatic Pathobiolology Laboratory was designed in 2007 and its outer shell was competed in October 2008. 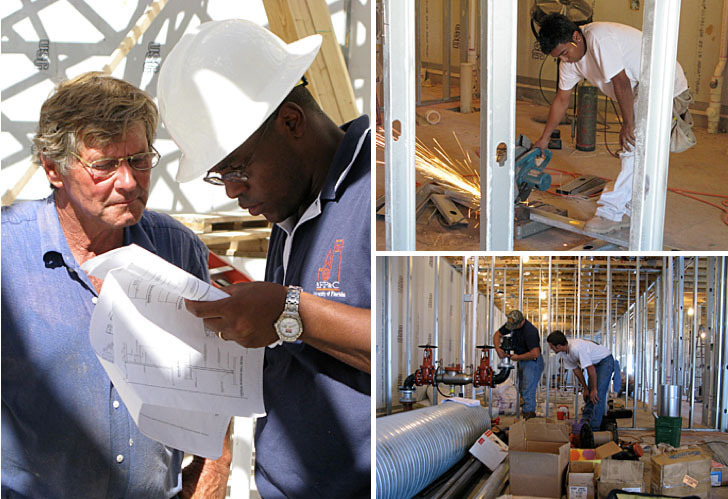 The interior construction was then completed and a certificate of occupancy issued in May 2009. Since then, over 850 boxes, along with numerous aquatic animal tanks, racks, pumps and husbandy systems have been unpacked and put in place. We are currently in the process installing the extensive filtration and water distribution system for the laboratory's animal facility. 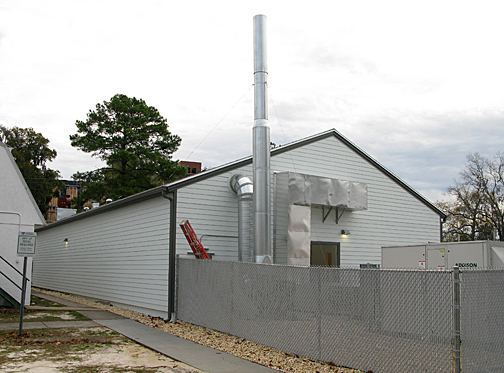 Construction of this facility was made possible by support from the University of Florida Emerging Pathogens Institute, College of Public Health and Health Professions, College of Veterinary Medicine, and Institute for Food and Agricultural Sciences. We are ecstatic to have received a contruction grant from the Department of Commerece, National Institute of Standards and Testing (NIST). 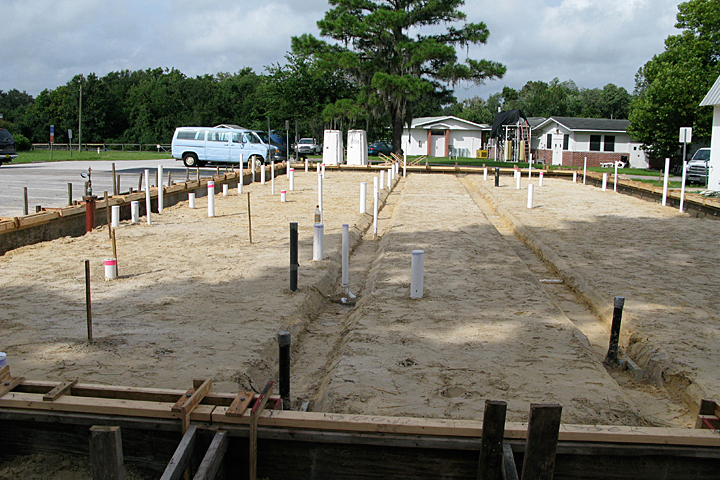 Through their funding, with additional support from the National Oceanic and Atmospheric Administration (NOAA), contruction of an expansion wing, connected to the East of the existing building, is currently underway. This construction project will effectively double the size of the building to approximately 6,800 NASF. This larger laboratory space will bring together researchers from the Colleges of Veterinary Medicine, Public Health with combined focus on freshwater, brackish and marine animal health, relating to both environmental and human health. The original "West wing" of the building will provide unique infrastructure to hold small- and medium-sized aquatic organisms for diagnostics, pathology and toxicology studies germane to understanding biotic outcomes of environmental stress exposures. Specialized rooms within the facility include a water filtration room, a small animal exposure room, a behavioral toxicology room, an “Aquatic Habitat” exposure and grow-out room, two modular holding/exposure rooms, a small animal necropsy room, a wet laboratory with student desks, and a research office/library. The facility includes a lavatory, a telecommunications room, and storage/equipment space in the extra-wide common hallway. The holding/exposure rooms of the facility will contain multiple flow-through and recirculating systems for housing various freshwater and marine species. Five 350-gallon high-density polyethylene tanks and four 150-gallon tanks, used for holding specially prepared or hauled water will be available for culture and testing of freshwater, marine and estuarine organisms with consistent water quality. An uninterupted, dedicated water filtration and delivery system will non-chemically dechlorinate and distribute water to tanks throughout the Laboratory. Adjacent to the facility is the Center for Environmental and Human Toxicology and the soon-to-be-completed Emerging Pathogens Institute (campus map). With synergy from these and other research groups, campus-wide and regionally, the Aquatic Pathobiology Laboratory will provide an excellent research and teaching environment to study aquatic organisms. In July 2008 the site was prepared, leveled with clean fill, and plumbing, electrical and telecommunications infrastructure roughed-in. 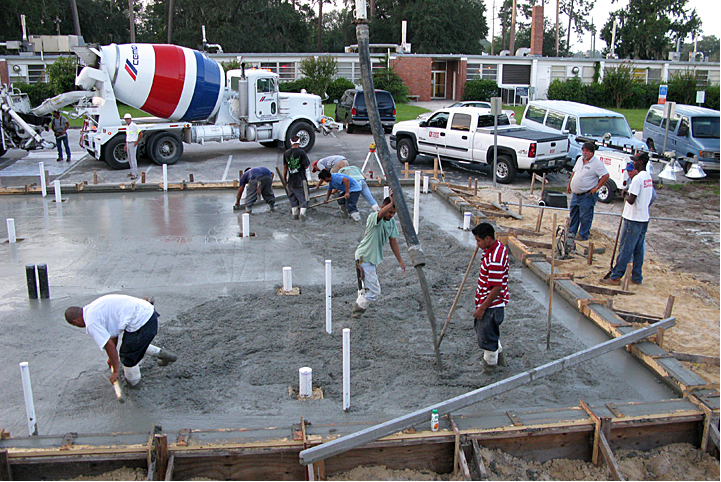 Concrete slab was poured so that room floors slope to their respective central drains. 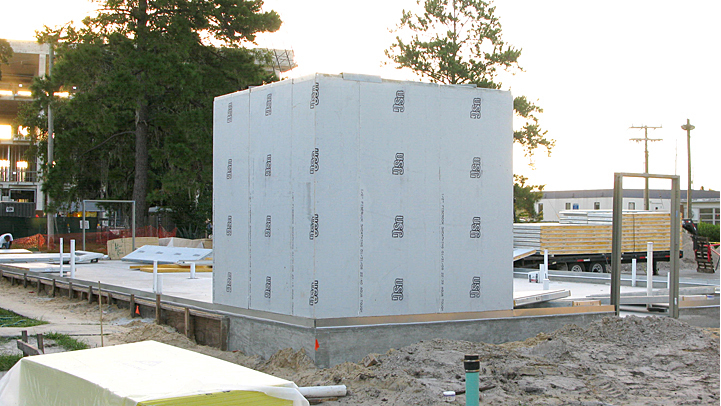 Walls were prefabricated to faciliate the installation process and timing. 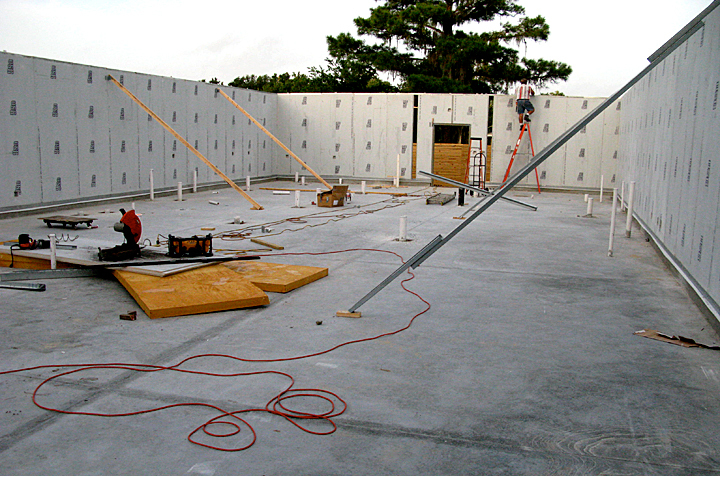 Preformed walls were erected in just several days. Gables and trusses were erected just a week later (late September, 2008). 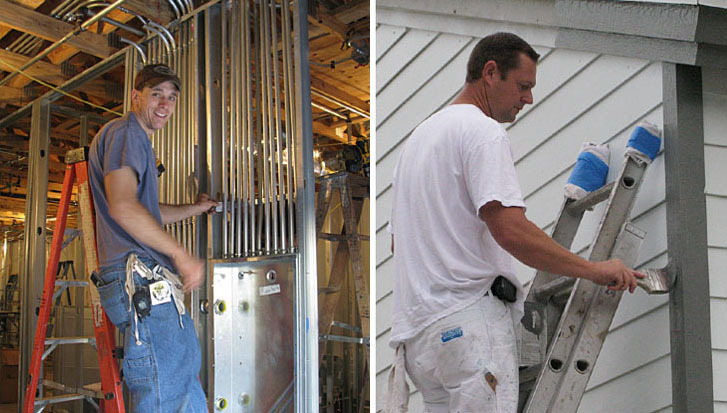 Teamwork and professional experience from different trades moved various portions of the project along. 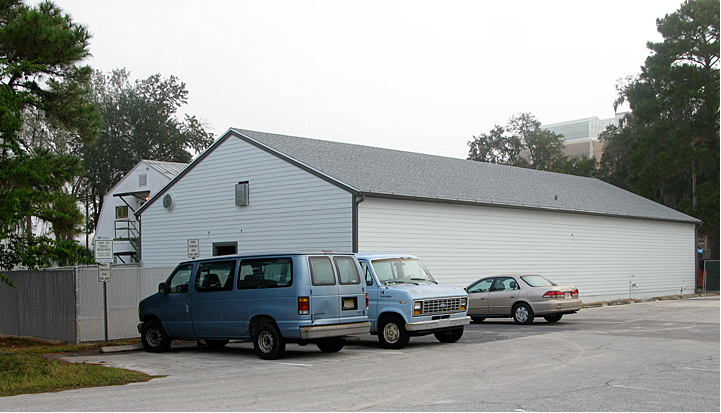 Exterior shell of building was completed mid-October, 2008.
yard on the West end of the building. Drop ceiling has been installed and electrical support is available throughout the interior of the building. 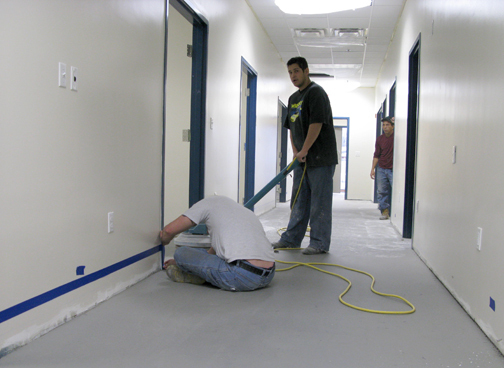 The flooring team is preparating the walls to apply an an epoxy coving that will be integral to the flooring system.